When you get right down to it, most mummy movies are more or less the same. Guy becomes mummy, mummy is awakened, mummy discovers reincarnated princess that he loved back in good ol' Egypt and mummy deals with unrequited love and undead emo. So, when it comes to mummy movies, it generally not the story that makes it a good one. Instead, they have to rely on actors, themes, sets and cinematography. Luckily, The Mummy (1959) has all of this in spades, making Hammer's renowned contribution to the genre not only a good mummy movie, but a damned good film overall. 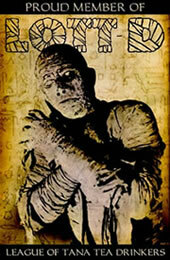 Screenwriter Jimmy Sangster actually appropriated most of the story from the earlier Universal Mummy films. He claims this was completely accidental1, but the fact remains that the main storyline mirrors such classics as The Mummy's Hand and The Mummy's Tomb, right down to the names of the characters and the made-up Egyptian god. John Banning (Peter Cushing) is in Egypt with his father, Stephen, on the verge of discovering the lost tomb of Princess Ananka. During the course of the expedition, he has badly injured his leg, but, rather than going back to base to have it properly set, he stays at the dig site so his father can live his archaeological dream. Unfortunately, after opening the tomb, the senior Banning discovered the Scroll of Life, a document secret to the Egyptian god Karnak. And he does what they always do in the mummy moves - he reads the darn thing. And, ever predictable, the mummy (Christopher Lee) comes to life. Fast-forward three years. John Banning is a respectable gentleman, Stephen Banning is in the crazy house, and a weird Egyptian guy has just come to town with a very large box. Soon, there's an ancient priest turned mummy named Kharis on the loose, and people start dying. And, of course, John Banning's wife looks frighteningly like the deceased Princess Ananka. Now, I realize how cliché that sounds. Who in their right mind would want to watch that? Me, that's who. Despite the overwhelmingly cliché story, it is so well told that you never realize you're watching something familiar. The pacing is fantastic, never too slow, never too fast. The story begins in the past, offering a brief backstory and explaining both John Banning's limp and the motivations of the mummy. Once in the present, the story jumps right in with a crazy old man's stories of living mummies, a mysterious box falling into the bog, and the mummy arising from the mud and murk into turn-of-the-century England. The instant you start to get bored, the story changes yet again, moving into a flashback sequence that explains how the mummy came to be, creating not just a monster, but a character we can sympathize with. Before you know it, the film is half over. And then the fun really begins – the last sequences being filled mostly with mummy attacks and anti-mummy stratagem. By the time the film concludes, it's hard to believe that 88 minutes have actually elapsed. I say bravo. This pacing is complimented by some very competent direction on the part of Terence Fisher. Most notable, I think, is Fisher’s ability to create menace without gore. The film rarely descends into visceral thrills, instead depending on the viewer's imagination to fill in the gaps left by the filming. During Ananka's burial scene, in which a whole slew of people are set to be executed, we never actually see anyone die. Right as the guards align themselves behind the Nubian slaves, who are to accompany Ananka into the afterlife, the scene changes, showing only the unmoving face of Kharis, high priest of Karnak. Then, second later, we see the same guards behind the doomed maidens, their swords newly soaked in blood. Each maiden is visited by the camera in turn, blessed by Kharis, and then bows her head. The camera moves on, leaving her to her death. The effect is grisly, without being gory. Aside from a few moments spend strangling John, the Mummy actually perpetrates very little personal violence in the film. This does not, however, diminish his menace. In fact, given that two people are dead because of the mummy, but murdered in ways we are not privvy to, makes Kharis seemingly more dangerous. Fisher plays up Kharis’s overpowering presence using perspective to make the mummy look bigger when he's determined to a purpose. When Mehemet, the aforementioned weird Egyptian guy, instructs Kharis to kill those who have invaded his beloved's tomb, the Mummy practically towers, appearing to be almost two heads taller than his supposed master. Now, Christopher Lee may be a tall man, but he's not that tall, and, after a few seconds of looking at the screen, it's obvious that it's just an optical illusion. But it doesn't matter. The image of the Mummy looming dangerously over Mehemet and resolved to his mission is one that sticks with you, and, no matter how obvious the trick, the sense of foreboding radiating from that scene pervades the rest of the film. The clever direction is complimented by production designer Bernard Robinson’s equally clever sets. What makes the sets clever is that they are everything we imagine. The tomb of Ananka is cluttered with ancient relics in impeccable condition, apparently untouched by time. It's exactly what I imagined King Tut's tomb to look like when I was 10. There's nothing realistic about the Egyptian sets, and we don't notice. Instead, the beautiful layout and colors and glittering golden artifacts transport us back to the Egypt of our childhood, the fantastical, magical one where tombs are cursed and mummies really do come to life. The sets of turn-of-the-century England are equally opulent, if somewhat more subdued. We've left the exotic world of Egypt for the more civilized English countryside, but we haven't left the sweeping, fantastical atmosphere behind. Instead, we're given a lush, cultured, romantic vision of what England might have been like, what we would like it to be like, and we continue in our imaginary world, one in which walking mummies, while slightly out of place, remain plausible. And everything I've mentioned thus far pales in comparison to the acting, particularly the performances of Christopher Lee and Peter Cushing. Cushing's performance is probably the easiest of the two to discuss, since he's front and center for the entire film, rather than being buried under a mound of make-up and costuming. Cushing's Banning is the perfect English gentlemen – intelligent, collected, and oh-so-refined. When he talks in that cool, detached voice, telling the town inspector without blinking that he saw a walking mummy or coldly instructing his wife to go upstairs, we feel like we could drown in the Englishness of it all. Normally, a performance like this could become monotonous, so unfeeling as to be disengaging to the viewer, but Cushing offsets this with an uncharacteristic intensity, a passion that lies just below the surface of Banning's collected exterior. It's a passion that is almost reminiscent of the hot, unpredictable desert from which he unearthed Ananka's tomb. Because of this carefully constructed performance, when Cushing's performance becomes more emotional, more panicked, and, frankly, more human at the end of the film, the transformation is unsurprising. The sudden shift of characterization could have devolved into unbelief, but in Cushing's hands, it seems a natural evolution, a final result that was an entire film in the making. Lee's equally brilliant performance is impossible to discuss without first talking about the make-up. Roy Ashton did a fantastic job outfitting Lee for the Mummy. He's swathed in bandages, with bits of them almost falling off, resulting in the entire get-up just oozing age. The Mummy, through costuming alone, becomes an ancient, almost decrepit, force of destruction, so obviously out of its element in turn-of-the-century England. But where Ashton’s really shines is when it comes to the Mummy's face. The Mummy's face is entirely encased in bandages, leaving only the eyes exposed. The genius, however, is in the eyes themselves. Rather than leaving them be, Ashton actually constructed fake eyelids for Lee, so that his eyes matched the rest of the make-up. The effect is that Lee's eyes blend, the only visible part of him becoming part of the costume. 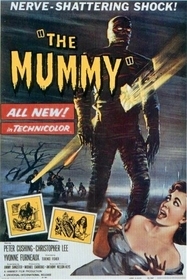 Because of this one, particular decision, Lee becomes the Mummy visually, rather than just being a guy looking out through a well-constructed Mummy suit. It's amazing, really, given how little of Lee's features are exposed, how wonderful the performance really is. The man's gaze is smoldering, his eyes brightening and widening when the Mummy is given purpose, and then dimming, becoming droopy and dull when his purpose is fulfilled. One scene in particular, when Kharis is being originally entombed, the camera gives us a close-up of Lee's face. If you've never seen a Mummy with an “Oh s**t” look, you should check this out. Lee's expressive eyes are complimented by poise and gesture. The Mummy's posture changes depending on his mood. He appears menacing and angry when attacking those who desecrated his beloved's tomb, and then, with the appearance of Mrs. Banning, he emanates sadness and longing – without once uttering a single syllable. The final scene of the film, when Kharis releases Mrs. Banning into the bog and faces the armed vigilantes is downright heartbreaking. His reluctance to let go of the woman he believes to be the reincarnation of his beloved is evident in every moment, ever hesitation. His eyes are sad, almost as if saying goodbye one last time. Thanks to Christopher Lee, Kharis isn't just a monster; he's a sympathetic character in an already complex film. It could be said that almost every mummy movie ever made is about the arrogance of western, modern society in regards to ancient and foreign cultures. The Mummy is no exception. Stephen Banning breaks into Ananka's tomb, with no regard for the dead of another's culture. Further, he dismisses a native, our aforementioned Mehemet, who warns him not to desecrate the remains. This act, if done in, say, an English monastery, would be unfathomable, but, because the tomb is ancient Egyptian, it's just science to Banning. Unfortunately, the ancient world of magic and superstition is not as silly as Stephen Banning thinks, and it comes back to bite him. The mummy rampages and terrorizes the modern world, which is ill-equipped to handle it. The undead can't be explained by science, and so the modern archaeologists (both Stephen and his friend, Joseph) not only receive their comeuppance, but are effectively emasculated by the ancient world. Arrogance and ignorance, under the mask of science, is what really destroys the archaeological team that desecrates Ananka's tomb. The mummy is only the instrument. Interestingly, John Banning is the only member of that original team that is not destroyed by Kharis. Superficially, it could be said that he was just lucky, that his wife resembled Ananka, and that fact saved his life. But it's really more than that. Ignorance and arrogance – his father's to be exact – cripples John during that fateful expedition. He has a limp throughout the entire film. However, his handicap is more than physical. His father's arrogance has also crippled him emotionally and mentally. He is shackled by his father's blind unconcern and constrained by the same flawed Western thinking. Thus, The Mummy is also about how the son, John, transforms himself and breaks free of his father's curse. At the beginning of the film, John Banning is cold. He dismisses his father's stories of a living mummy as a crazy man's rambling, and, towards a woman who is passionately in love with him, behaves indifferently and dismissively. However, as the film progresses, John Banning's eyes begin to open. He begins to believe in the possibility of magic and the undead – a very non-scientific supposition – and, when Kharis begins to threaten his wife, he becomes concerned and compassionate, deeply fearing for his safety. This transformation, which frees him from the influence of his father's thinking, is complete when Kharis steals his wife away, taking her back to the bog. Not only does John react emotionally, obviously frightened for the woman he loves, he is willing to sacrifice the Mummy, an intellectual curiosity and important archeological find. He destroys the Mummy for the safety of someone he loves, giving up knowledge for emotion. He makes the sacrifice his father didn't three years ago. The Mummy wins at filmmaking on all counts. If it sounds like I'm gushing a bit, I am. Few films have really impressed me as much as this one, and it's one I look forward to seeing again. It is not only wonderfully effective on all levels, it has a maturity and depth that are easily overlooked in the genre. Mummy movies may be a dime a dozen, but Hammer's The Mummy is worth a whole lot more. 1. Johnson, Tom, and Deborah Del Vecchio. Hammer Films: An Exhaustive Filmography. McFarland & Company, 1995. Christopher Lee kept getting injured on the film - the squibs used when Cushing "shot" him left burn marks, he threw out his back carrying Yvonne Furneaux, and he dislocated his shoulder (crashing through a door that had accidentally been bolted shut). Submitted by William Ainsworth (not verified) on Sat, 2010-10-16 19:16. It was difficult to suspend my disbelief when that tomb was opened to find it completely lit up inside. And I know that it would have spoiled the story if made realistic, but it seems the mummy spent part of his two thousand years learning English so that he could understand the heroine's orders. Submitted by Anonymous (not verified) on Sat, 2010-11-06 05:45.
the thing, the wolf man, FOUR framkenstien ECT.